Last Update: 14 December 12; Columns: 4+; Compatible Browsers: IE8, IE9, Firefox 3, Firefox 4, Safari 4, Safari 5, Opera, Chrome; Software Version: WordPress 3.5, WordPress 3.4, WordPress 3.3; Documentation: Well Documented; High Resolution: No; Layout: Liquid; ThemeForest Files Included: Layered PSD, JPG Image, CSS Files, JS Files, PHP Files; Widget Ready: Yes. Hey guys, i’m still working on the small update of Maxx (v1.4.1) with new Wordpress Media Uploader since 3.5 , the next small update will be up soon after testing carefully to make the theme FULLY compatible to wp 3.5(or up) and older versions. So, if you are having issue with the upload images button in Portfolio image Settings, please use the latest Media Uploader by Wordpress (Add Media Button right above the editor). All the uploaded image to portfolio gallery also will be used for the single portfolio slider as usual. Maxx WP is a Modern Clean & Creative theme suitable for any corporate business or portfolio,It’s created by using the latest techniques : HTML5 and CSS3 . With a extremely responsive design That means it will fit any device (Desktop, tablet, smartphone…), completely optimized for your touchable device. Maxx has everything you’ll want for your business website. Comes with highly customizable theme Option Framework like you can change the skin easily, or define your own style, typeface, turn on/off responsiveness …ect. Visual Shortcode Generator allow you to mix complex information into a post/page without coding knowledge. Localization Supported (.po & .mo included in case you want to translate the them). SEO (Search Engine Optimization) has been made a priority when building the themes. And a Very detailed documentation guides you to use the theme quickly. If you are viewing by laptop or desktop try Resizing your browser to see how the layout automatically flows based on the width of the browser. if you have a smartphone/tablet handy ? Scan the QR code below! If you have any question about the theme , you can drop me a comment .Thanks. Fixed images didn't appear in ie8. Fixed gray bar in IE 9. Fixed page title doesn't show properly in IE9. Fixed menu dropdown, shortcodes in WP 3.5. Added translattion string to Skitter Slider. Add more Social Networks Link. Changed theme option upload file to native wordpress uploader. Added function allow to disable comment area on all pages. Added background options for boxed-layout style. Added new flexslider that allowed to use video on slider. Speed Up Page Response Times. Reduce the page title space. i have made some changes to name of page templates so Please re-config the front page (home page). Maxx - Clean and Modern HTML template. Keywords: 3.5, Manh, business, clean, corporate, elegant, light, maxx, minimal, modern, portfolio, services, showcase, sidebar, unlimited. Premium ThemeForest Maxx Responsive Creative Wordpress Theme 2488296 WordPress Themes, Website Templates, Mobile Themes, Flash Templates & Scripts from creative professional designers. Full details of ThemeForest Maxx Responsive Creative Wordpress Theme 2488296 for digital design and education. 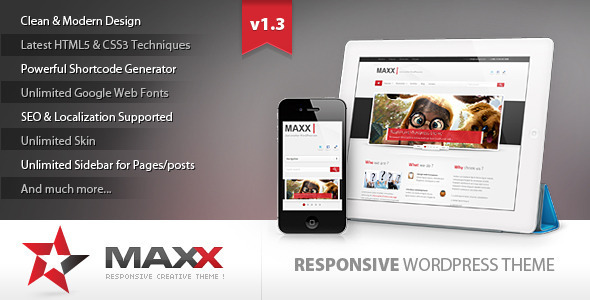 ThemeForest Maxx Responsive Creative Wordpress Theme 2488296 desigen style information or anything related.